Here's another addition from the Steve Elaschuk collection. Why do we care about this? Hint: it's not their cover of Black Sabbath's Paranoid. James Hayden played drums with these guys, assumedly before he went on to Fire Engine Red. This pretty much provides the missing link between his FER days and his current gig, playing with the legendary DOA. thanx a lot! I like this kind of crossover-hc-thrash! James Hayden aka Floor Tom Jones is no longer on the DOA train, having jumped off a couple years ago. Though he remains good friends with them. 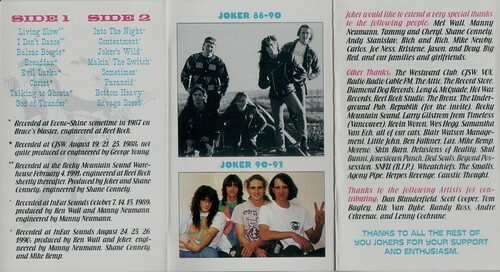 Other notable Calgary projects he was a part of: Von Zippers, Thousandsticks, Ramblin' Ambassadors. Current member of Vancouver's Greenback High.